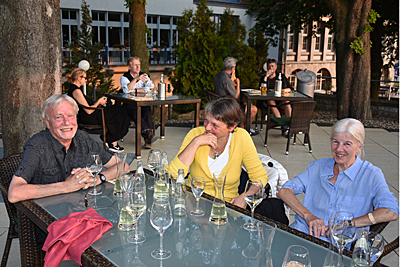 The 2017 FOC Condin was held in Freyburg. 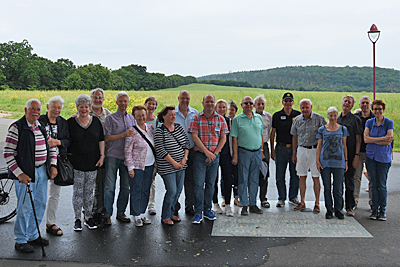 The twenty-one attendees visited the nearby Nebra Sky Disk museum. 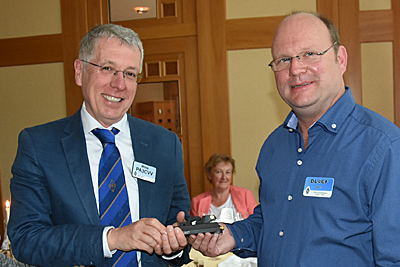 The Begali prize HST paddle was won by Miles PA3CVV, and is being presented by FOC Condin organiser Joe DL4CF. 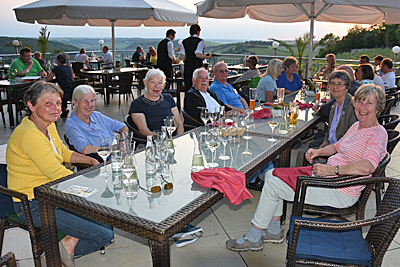 Drinks and dinner out in the evening sunshine on the patio at the Berghotel zum Edelacker in Freyburg. 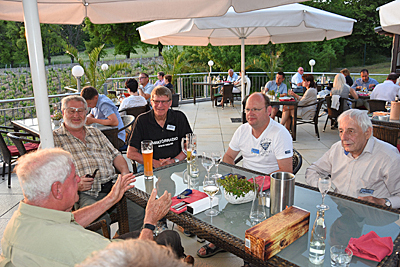 Bal DJ6SI (back) explains some finer points of DX operating to Klaus DK8EI, Rune SM5COP, Joe DL4CF and Knut DK5AD. 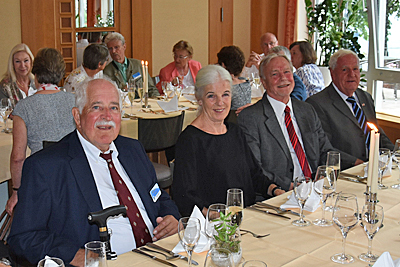 Kees PA5XM, Birgit (xyl Ben DJ8FW/CT3AS sk) and Ans. 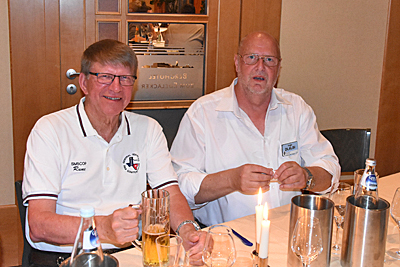 Gerd DJ4KW and Bo HB9BFQ (until recently F5VCT). 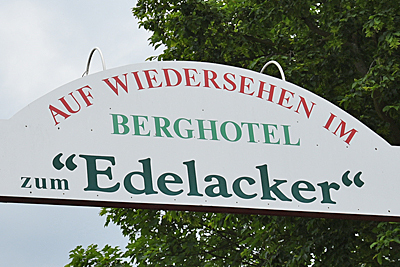 Berghotel zum Edelacker in Freyburg (about 70km from Leipzig) was the venue for the 2017 FOC Condin. 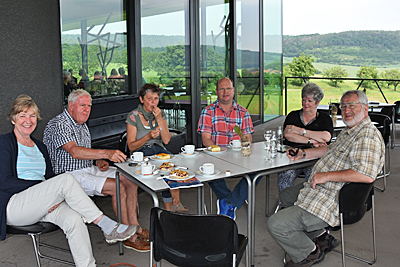 At the Nebra Sky Disk museum : Anneliese, Baldur DJ6SI, Birgit (xyl Ben DJ8FW), Angelika (xyl DK8EI) and Klaus DK8EI. 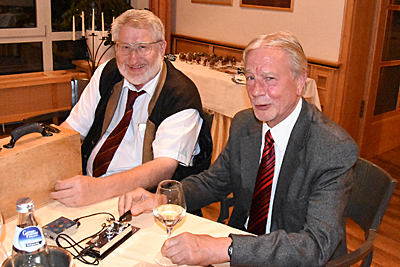 Sitting down for the 2017 Condin : Gerd DJ4KW, Ans (xyl PA5XM), Kees PA5XM and Baldur DJ6SI. 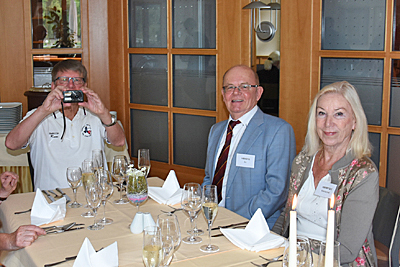 Rune SM5COP (takes a picture of the photographer taking pictures), Bo HB9BFQ and Marianne. 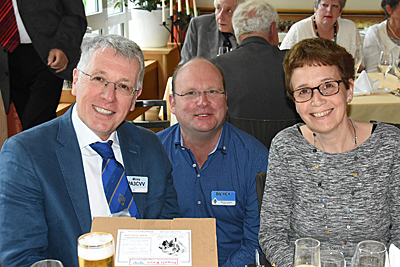 Winner of the Begali prize draw paddle Miles PA3CVV, Joe DL4CF and Jane (xyl PA3CVV). 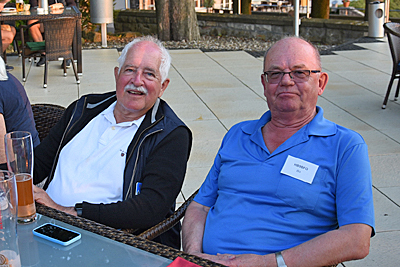 Klaus DK8EI and Kees PA5XM playing with a paddle after dinner! Rune SM5COP and Ingo DL6LBI.... ....time to go home : Rune SM5COP loads up the boot of his car with sekt ready for the long drive back to Sweden. 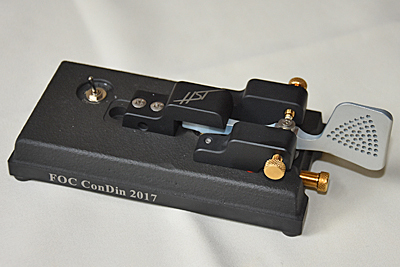 A Begali HST Single Lever Key was the door price (won by Miles PA3CVV) at the 2017 FOC Condin. Mni tnx Begali! 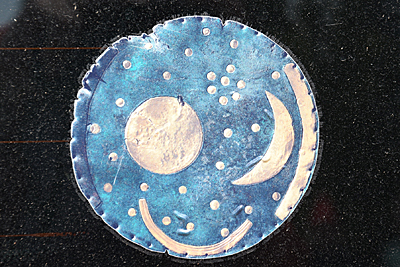 The 3,600 year-old Nebra Sky Disk is a Bronze Age depiction of the cosmos. The original disk was found near Nebra. 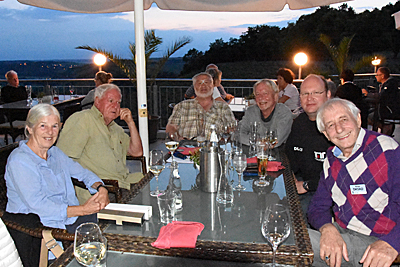 Ans (xyl PA5XM), Baldur DJ6SI, Klaus DK8EI, Kees PA5XM, Joe DL4CF and Knut DK5AD. 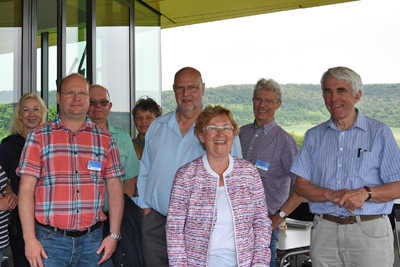 Marianne (xyl HB9BFQ), Joe DL4CF, Bo HB9BFQ, Birgit, Ingo DL6LBI, Christine (xyl DJ6ZM), Tof DJ6ZM and Nigel G3TXF. 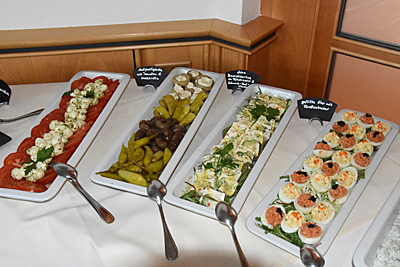 A fine spread of food for the 2017 FOC Condin. 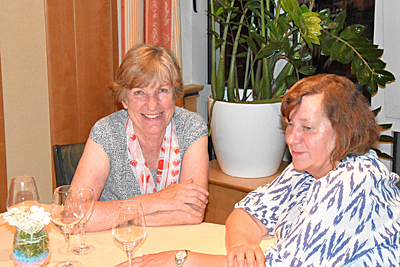 Anneliese (xyl G3TXF) and Inge (xyl Ingo DL6LBI). 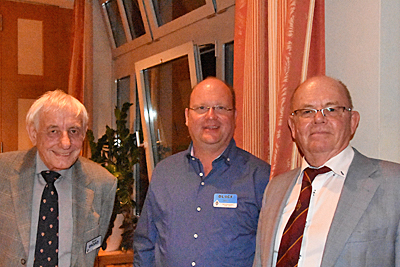 Knut DK5AD, Joe DL4CF and Bo HB9BFQ. 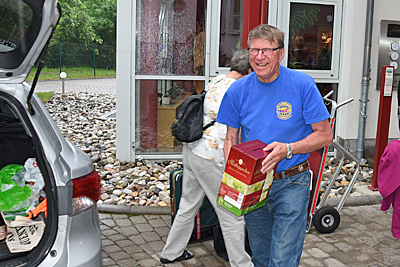 Heidi SM5NZG and Rune SM5COP load a box of liquid souvenirs from Germany before setting off for Sweden.